Two of our favorite Wichita institutions come together each summer for a free event you won’t want to miss. Tunes + Tallgrass celebrates the ongoing collaboration between the Wichita Art Museum and Tallgrass Film Association, which puts on Wichita’s annual Tallgrass Film Festival each October. 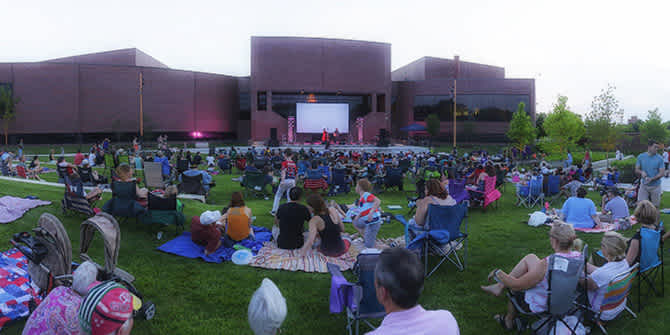 Tunes + Tallgrass offers live music and a film screening in the museum’s Art Garden, a lush landscape of trees, shrubs, perennials, grasses and sculptures alongside the Little Arkansas River. The fifth annual event is 6:30 to 10:30 p.m. on June 23. Music starts at 7 p.m., the film will begin at 9 p.m. Admission is free but you’ll want to bring money for the food trucks – Funky Monkey Munchies, The Flying Stove and Kona Ice – as well as the cash bar run by the museum’s Muse Café. You can also choose to pack your own picnic for the event and don’t forget the Frisbee! Bring your camp chairs, lawn chairs or picnic blankets as the limestone seating in the garden’s amphitheater is limited. Live jazz will begin at 7 p.m. with the William Flynn Quintet. A Midwest native, Flynn is a guitarist and composer emerging onto the contemporary jazz community with an increasingly original musical voice. As a performer, he has spent years playing and freelancing in the Columbus, Ohio; Dallas, Texas; and Wichita areas. Flynn currently serves as Assistant Professor of Jazz Guitar at Wichita State University, where he teaches applied jazz guitar, jazz improvisation and directs the Guitar Ensemble. His 2015 CD release, “The Songbook Project,” is his debut with Armored Records and features his modern jazz arrangements of rock and pop music of the 90s and new millennium. “Rear Window” will start at 9 p.m. It is considered one of Alfred Hitchcock’s best films and is included in the American Film Institute list of 100 Years—100 Movies, a reflection of the very best American films. Beware the danger of spying on your neighbors in this 1954 masterpiece featuring the gallant James Stewart and beauty Grace Kelly. This thriller takes place in the heat of summer in a Greenwich Village apartment complex. During a powerful heat wave, the mystery ensues with neighbors and a dose of voyeurism.